Indonesia´s economy is expected to grow 5.1% in 2017 after a 5.0% increase in 2016, mainly driven by robust private consumption and business and government investments. The administration strives to strengthen the economy through improved infrastructure and increased foreign investments. Additionally, it intends to develop the manufacturing base, diminish dependence on the resources sector and reform the less productive agricultural sector. A slowdown in China’s economy in 2018 will exert pressure on Indonesia’s exports, causing GDP growth in Indonesia to slow down slightly, to 4.8%. On average 45.1% of total Indonesian B2B sales was made on credit, almost in line with the 45.9% average of the region. Sales on credit terms by Indonesian businesses increased 2.0% compared to 2016 (43.1%). With 50.2% of the domestic and 39.9% of the foreign B2B sales value transacted on credit, suppliers surveyed in Indonesia were, on average, notably more likely to offer credit terms to domestic B2B customers than to foreign ones (averages for Asia Pacific: 49.5% domestic and 42.2% foreign). Sales on credit to both domestic and foreign B2B customers increased compared to the previous year (domestic: 48.1% and foreign: 38.1%). This behaviour is consistent with that observed across most of the region. Following a minor decrease from 41.1% in 2015 to 40.7% in 2016, the percentage of overdue B2B invoices in Indonesia increased again in 2017, to 43.2%. 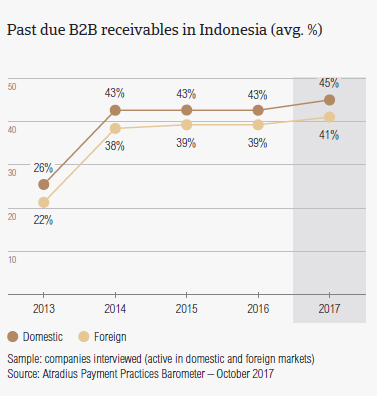 The percentage of overdue B2B invoices reported by Indonesian respondents has increased in 2017, to 45.1% of domestic transactions (42.8% in 2016) and 41.2% of foreign transactions (38.6% in 2016). In 2017, 91.8% of respondents in Indonesia reported late payments from their domestic B2B customers. This percentage is higher than that registered in respect to foreign B2B customers (86.4%). The average Days Sales Outstanding (DSO) figure in Indonesia is 46 days (no change from 2016). This is six days longer than the average DSO for Asia Pacific overall. Looking ahead, 45.0% of respondents in Indonesia foresee a significant and 22.3% a slight increase in their annual DSO in the coming 12 months. Compared to the Asia Pacific average of 12.9% of respondents expecting a significant increase the figure for Indonesia is by far the highest in the region. Only 15.5% of Indonesian respondents expect a slight or significant decrease. With an average of 52 days, Indonesia´s invoice to cash turnaround is shorter than the Asia Pacific average of 55 days. In 2017, domestic B2B customers of respondents in Indonesia were given, on average, 24 days from the invoice date to settle their invoices. This is five days shorter than the average domestic payment term in 2016 (29 days). Average payment terms granted to foreign B2B customers have been shortened from 28 days in 2016 to 21 days this year. 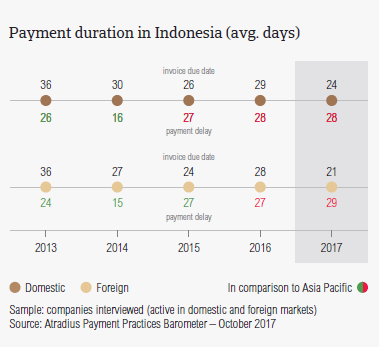 Respondents in Indonesia reported average payment delays from their domestic B2B customers to level off at 28 daysin 2017, (28 in 2016), while foreign B2B customers delayed payments 29 days on average, a modest year-on-year increase from 27 days in 2016. The average payment duration in Indonesia improved from 57 days in 2016 to 52 days this year. This means that compared to one year ago, respondents in the country manage to turn B2B invoices faster into cash. Insufficient availability of funds was the most frequently mentioned reason for payment delays in Indonesia and in the Asia Pacific region overall. 50.5% of respondents in Indonesia cited insufficient availability of funds as the primary reason for payment delays by their domestic B2B customers. This compares to a lower percentage of 43.8% in the Asia Pacific overall. Looking at payment delays by foreign B2B customers, 40.2% of respondents in Indonesia said that delays occurred mainly because of the complexity of the payment procedure. This is also the most frequently cited reason at regional level (34.9%). The issue of complexity of the payment procedure was also the second main reason for domestic payment delays (36.2%) followed by formal insolvency of the buyer (32.5%). At regional level those figures are much lower, with 27.4% of respondents citing complexity of the payment procedure and 20.8% the formal insolvency of the buyer as reasons for delay. The second most frequently cited reason for payment delays by foreign B2B customers was insufficient availability of funds, stated by 34.9%. This is also the second most frequently cited reason at regional level (33.3%). A low 19.9% of respondents in Indonesia said that payment delays did not have a significant impact on their businesses. 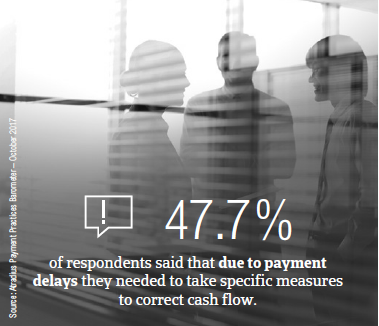 However, 47.7% said that late payments caused them to take specific measures to correct cash flow and 43.7% stated that they had to postpone their own payments to suppliers. Respondents in Indonesia were the most likely of the respondents from countries surveyed in the Asia Pacific region to increase their use of credit management tools to protect against the potential impact of a slowdown in Asia, US protectionism and Brexit. 32.9% of respondents in Indonesia reported that they will make no changes in their current mix of credit management tools. However, 39.1% - the highest for the region (regional average: 30.3%) said that they intend to do more to protect themselves against the risks surrounding the above-mentioned developments. 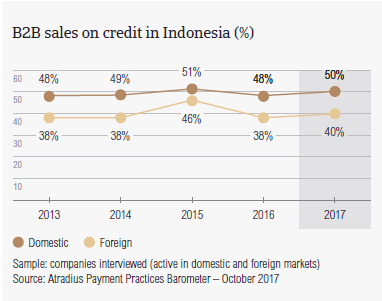 Respondents in Indonesia are most likely to increase checks on buyers’ creditworthiness (cited by 47.6%) and monitoring of buyers’ credit risk (46.9%). Their peers in the Asia Pacific demonstrate a similar profile for risk management intentions (increase creditworthiness checks: 28.2%, increase monitoring of buyers’ credit risk: 30.8%). The slowdown in Asia seems to be the most likely to spur respondents in Indonesia to adjust their credit management practices. 50.7% plan on increasing creditworthiness checks and 47.1% plan on increasing credit risk monitoring. To manage potential risks stemming from US protectionism and Brexit, respondents in Indonesia stated their intention to increase creditworthiness checks on their buyers (US protectionism: 47.5%; Brexit: 44.6%)% and monitoring of their buyers’ credit risk (US protectionism: 47.5%; Brexit: 44.3%). Of the Asia Pacific countries surveyed, Indonesia had the third highest value of B2B receivables written off as uncollectable (2.1%) (India: 2.6% and Hong Kong: 2.4%). Indonesia´s figure is on par with the percentage registered at regional level, which also stood at 2.1%. Like in 2016, domestic receivables were written off as uncollectable more often than foreign ones. The total value of B2B receivables written off as uncollectable decreased slightly year-on-year in 2017, by 0.1 percentage points, to 2.1%. More specifically, there has been a decrease in the value of domestic B2B write-offs from 1.8% in 2016 to 1.6% in 2017, while there has been a slight increase in the value of foreign write-offs in 2017 compared to 2016 (0.5% versus 0.4%). Uncollectable domestic receivables in Indonesia originated most often from the construction (20.2%), consumer durables (17.4%) and services (10.4%) sectors. 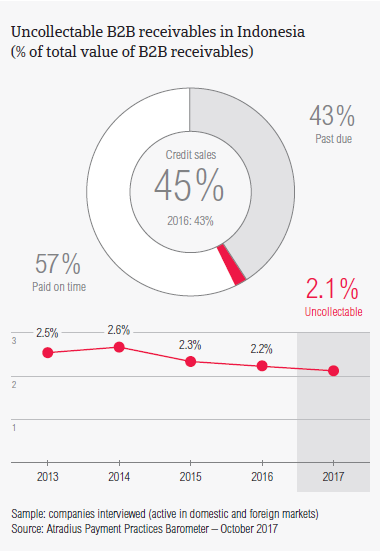 B2B receivables were reported to be uncollectable mainly because the customer went bankrupt or out of business (65.4%), the failure of collection attempts (42.0%) or the debt being too old (41.5%). More respondents in Indonesia expect a significant improvement than deterioration in the payment behaviour of their B2B customers over the coming 12 months. Based on the survey findings, respondents in Indonesia extended the most lenient payment terms to B2B customers in the metals sector (54 days from the invoice date), chemicals (37 days), construction materials and agriculture (both sectors with 33 days). The shortest payment terms were granted to B2B customers in the paper (12 days) and food (20 days) sectors. 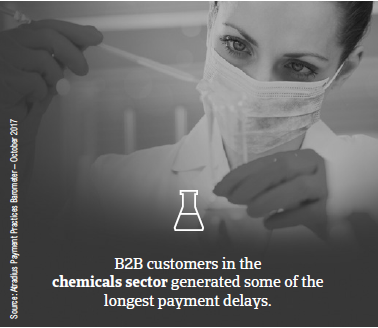 Customers in the chemicals and construction sectors generated some of the longest delays. B2B customers in these sectors, paid on average 39 and 38 days late respectively. The most frequently cited reasons for late payment of invoices in the chemicals sector were complexity of the payment procedure and disputes over quality of goods delivered or service provided; reported by 58.0% of respondents. In the construction industry the two most frequently cited reasons for payment delays were the complexity of the payment procedure (48.0% of respondents) and insufficient availability of funds (46.0% of respondents).